Back at the club where he feels loved, wanted and appreciated, Lewis McGugan didn’t take long to make an impact. Thirty-six minutes to be precise. Introduced at half-time by Owls head coach Carlos Carvalhal against York City, the midfielder illustrated where he will add quality and value to the team. His ability to pick out a pass, instigate attacks and his goalscoring prowess gave Wednesday an extra dimension in the second half. But McGugan’s big contribution in the Owls’ latest friendly came in the closing stages when he robbed Dave Winfield of possession and burst clean through on goal. A sharp, fully-fit McGugan is normally ruthless in a one-on-one situation but Michael Ingham saved his first effort. Marco Matias kept the move alive and eventually McGugan fired home. As he demonstrated during his two impressive loan spells at Hillsborough last season, McGugan is a class operator. He said: “It was good to get back out there and get the rust off. Asked if he has set himself a goal target for the 2015/16 campaign, McGugan said: “Every year, I set some sort of target in my head. Scoring goals is a massive part of my game and hopefully this season I can keep getting in the right positions. If things had gone according to plan, McGugan would have linked up with his Wednesday teammates a lot sooner than last Thursday. The 26-year-old admits he was frustrated by the delay in his move from Watford, accusing the Premier League club of holding up the transfer. McGugan, who is believed to have cost Wednesday £300,000, said: “Obviously it has been frustrating that the move kept getting delayed and it seemed when it got close Watford would move the goalposts a bit and we were back at square one again. “It is difficult and stressful as you want to know where you stand so that you can prepare for the new season, but I have been professional and went back to pre-season training and got my head down. Frozen out at Vicarage Road by Slavisa Jokanovic last season, McGugan is relieved his Hornets nightmare is over. “At the end I did not feel wanted by Watford and I don’t know why that was,” McGugan said. “I went to Sheffield Wednesday last year and it put a smile back on my face and I started to enjoy the game again. “I was playing games again for a manager who had faith in me and the fans were incredible to me. While McGugan’s goalscoring return was a big positive for Carvalhal, the Portuguese is acutely aware Wednesday remain a work in progress. What will have concerned him was their lack of penetration in the final third. Not enough chances were created. Carvalhal’s men also gave away a sloppy goal in the first period, allowing Marvin McCoy to slide in and bundle the ball in from close range. There were times when they appeared vulnerable on the counter-attack. As Carvalhal pointed out, there is still plenty of time to correct these mistakes before the big kick-off on August 8. Wednesday have three more matches to improve the players’ fitness levels and work on team pattern and shape. What is clear is that McGugan will be a big asset to the Owls over the coming weeks if they can quickly get him up to speed. York City: Flinders (Ingham HT); McCoy (Hare, 70), Lowe, Winfield, McCombe, Straker (Ilesanmi, 72); Summerfield (Rzonca, 62), Berrett, Penn (Meikle, 74); Carson (Platt, 62), Oliver (Godfrey, 72). 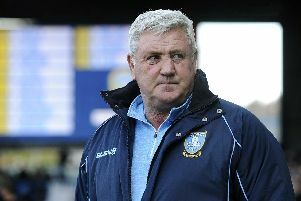 Sheffield Wednesday: Price (Dawson, HT); Palmer (Vermijl, 64), Lees (Loovens, HT), Sasso (Lachman, HT), Helan (Dielna, HT); Melo (Semedo HT), Lopez (Lavery, 64), Hutchinson (McGugan, HT); Matias, Wallace (Lee, HT), Bus (Nuhiu, HT). Subs used: Croasdale, Meadows, De Havilland, Wildsmith.